Browse the nation’s largest bonsai nursery, donate your footwear to a folk artist’s shoe tree, or pay your respects to the Lady in Red. Sing a duet with the world’s Number One Elvis Fan, skydive over the Delta, or explore a long-quiet ghost town. Dine on slugburgers and fries, sample catfish paté, or enjoy a gourmet meal with Morgan Freeman. Spend the night in a renovated sharecroppers shack, a luxury casino, or a haunted antebellum mansion. You’ll discover these and other adventures in the pages of Mississippi Off the Beaten Path, a guide to the state’s most unusual attractions, events, restaurants, and accommodations. Author Marlo Carter Kirkpatrick traveled to every corner of Mississippi conducting research for the 240-page book. Mississippi Off the Beaten Path is organized geographically, with the state divided into five regions—the Northeastern Hills, the Mississippi River Delta, the Eastern Plains, the Heartland, and Southern Mississippi and the Gulf Coast. The book provides maps and detailed directions to the out-of-the-way gems that make Mississippi a one-of-a-kind destination. Mississippi Off the Beaten Path is packed with interesting trivia about the Magnolia State, and includes numerous sidebars recounting Mississippi’s most colorful traditions, myths, and legends. Marlo Kirkpatrick is a freelance writer and resident of Madison, Mississippi, where she lives with her husband, wildlife photographer Stephen Kirkpatrick, and a growing collection of pets. Marlo is also the author of Wilder Mississippi and was a contributing writer for Jackson, The Good Life. "Mississippi Off the Beaten Path" is published by The Globe Pequot Press and is available at local bookstores and through www.amazon.com. 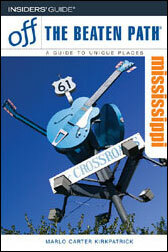 Please check their website for the latest edition of this guide to Mississippi. Autographed, personalized copies are available through the couple’s web site at www. kirkpatrickwildlife.com.